Join our Café Jam worship events! Would you like to learn some new songs and revisit familiar favourites in a relaxed and informal setting? Come and enjoy drinks and cakes, meet friends and make new friends at Café Jam. It's for all those who love to sing, of ANY ability. Come and join us in this enjoyable event - or just come to listen! Everyone is welcome to Café Jam. Cake donations welcome. We are available for bookings (for free) by any local church. Please contact Rita (07838 103310) for more information and to let us know that you are coming. Sunday 19 May 2019, 6pm for 6.30pm start, at Cross Lane United Church, 11 Cross Lane, Newton-le-Willows, WA12 9PT. Sunday 23 June, 4.30pm start at St Andrew's Meols URC, 6 Greenwood Rd, Meols, Wirral CH47 6AD. 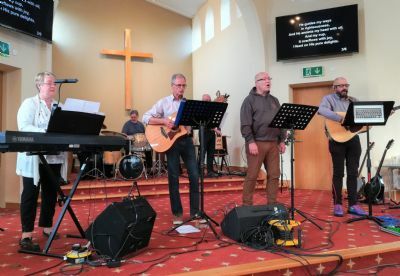 Please contact Rita (07838 103310) for more information – and if you would like the Café Jam band to come to YOUR church or event! Start times are flexible, from 4pm, to suit you.